Historical preservation of old buildings is a cause important to many people, including myself. Ever wonder what became of the buildings on old vintage postcards? Are they still standing? Collecting town view postcards, whether US or foreign, is one way old vintage postcard collectors help in this preservation effort. I thought it might be interesting to show a few “then and now” pictures of buildings that found their way onto postcards in my next couple of historical blog posts. Arlington Mansion in Natchez, MS Then …..
Arlington was built in 1816, and used to house antique furniture, paintings, and other rare articles. This national historic landmark served as a blueprint, both inside and out, for other federal style homes in the area. 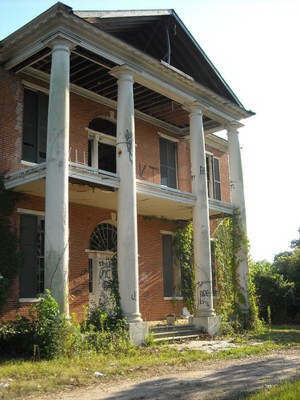 Vandals and fire have put the preservation of this once stately home in grave danger. How sad. The Briers in Natchez, MS Then ….. 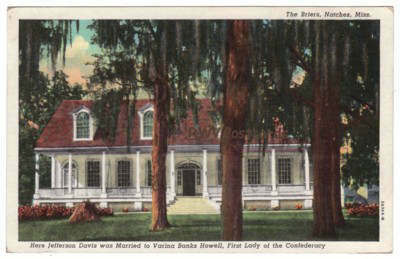 The Briers is where an 18 year old Varina Howell married Jefferson Davis, a man twice her age. It is nice this historical building, a sort of Confederate White House, was preserved. ** You are invited to stop back for my next “then and now” blog post, by clicking the bookmark button to the lower right. 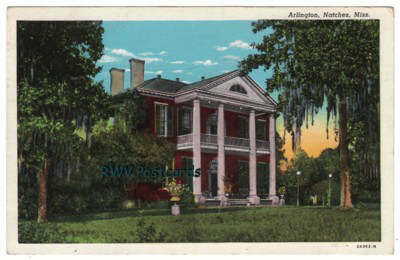 For more US State town view postcards, please visit Remember When Vintage Postcards – Bonanzle.